SkySchool MD Alex Ledger is an avid Military Historian and ever since he learned to Paramotor he has always wanted to fly over the D-Day beaches in Normandy, France…..in July 2010. The trip was a huge success which is why SkySchool plans to return in 2011 between the 17th and 24th July. The Trip is designed for Paramotor pilots who have either sat a SkySchool course or have a minimum of 10 hours. Guiding: £50 booking fee and then €30 a day. Includes guidance, instruction and a radio. Excludes kit, fuel, oil, accommodation, flights, food etc. The pilot will need to supply their own equipment. Guiding and Kit: £50 booking fee and then €60 a day. Includes a Paramotor, wing, reserve, helmet, headset, transport around the sites, a radio and guidance/instruction. Excludes kit, fuel, oil, accommodation, transport to France, food etc. Other costs which are not included are transport to France, accommodation, food and insurance. All fuel and oil costs are the responsibility of each pilot however SkySchool will supply fuel cans. Pilots driving over with their own equipment should take the ferry to either Caen or Ouistreham. Some pilots may wish to share vehicles to lower costs and SkySchool will link other pilots together. Click here to Visit this SkySchool D-Day page for more information and booking. A great paramotor video from SSzabi. The E-Walk has an integrated, brushless high-performance motor that brings pilots quietly into the thermals! What was still a vision in the skywalk Magalog is now reality: pure electrically-powered paragliding. 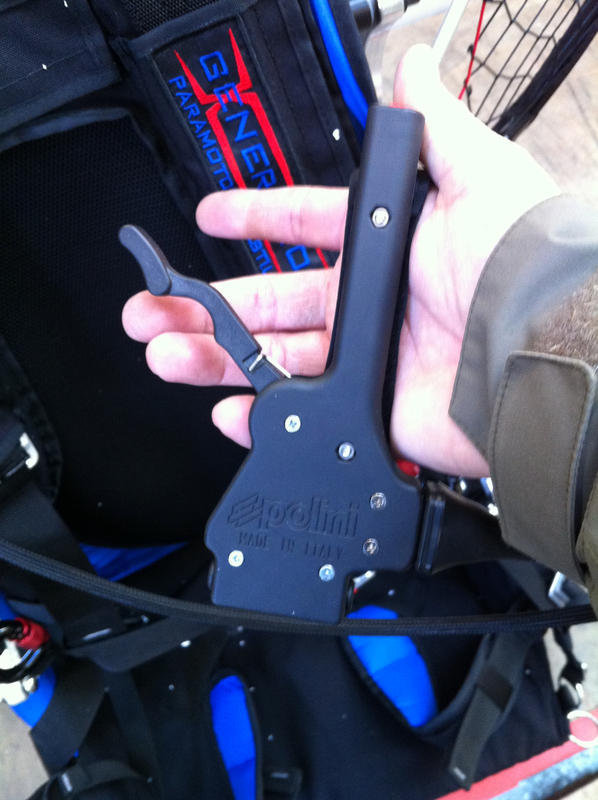 New Polini Paramotor Throttle as seen here in the UK fitted to our Thor powered X-Generation PPG Paramotor. The new throttle is light, small and fits easily in your hand. Its all plastic with a velcro strap. Big red stop button in the thumb position. There is also the option for an electric start. It requires two buttons to be pressed at the same time as a safety feature. As you know Paramania is constantly pushing the limits with design, safety and fun wings. Constantly working to develop the best technology, to be able to create really advanced designs. Their latest project, the GTX will be launched soon enough. Many of you have been waiting for the new performance wing to come along and Paramania has promised to create something really new, to replace the well known Action GT is not an easy task! While they work prototypes for the new GTX which has still not met the high Paramania standards. So hold tight pilots and fans, you know when it is here it will be the biggest news to the Paramotor sport sinse the rest of the Paramania line of reflex wings. I myself had been playing with the free version, but once watching this excellent youtube guide to the iVariometer, I instantly updated to the full version of this excellent app for paragliding iphone owners. check it out. Freedom Flight Center is once again proud to invite you to “The World’s Most Beautiful Beaches” and Beach Blast 2011 “Flying in Paradise”. 300 plus ppg pilots from 14 countries attended last years event and were treated to sugar white sands, and pristine gin clear water of the Gulf of Mexico. One of the many features of this unique fly in is that many pilots families also join them for Beach Blast as this is truly a resort for the entire family. Edgewater Beach Resort boasts 110 acres of accommodations including shopping, laser tag, parasailing, jet skis, fine dining, cocktail bars, Pizza Hut, and Starbucks right on premises. Many pilots commented how nice it was to take a flight and then be able to spend time with their families in the many activities and then return to the beach to fly again anytime they pleased. Vendors row was stacked with the latest and greatest of gear from major manufacturers here and abroad and pilots from major wing companies flying exhibitions for the crowds. This year they will be holding the “Beach Blast 2011 National Comps” as Well as “Beach Blast 2011 Kiting Challenge”. Last years event produced an all time classic kiting competition that had the crowd roaring as contestants competed for cash and trophies. During Guadalquivir 400 kilometers competition in Spain, in order not to loose any second by landing, the Passion’ailes team (Mathieu Rouanet) successfully attemps a ground to air refueling. No time lost. Opale Paramodels, Manufacturers of full size paragliders and the RC Soaring Paraglider which are now available in the UK through selected dealers. The Paramodel kit is custom made with fine details to make it fly as realistic as possible. The Spiral 1.2m² wing is the result of a long development, using the highest glider software. Spiral is a combination of performance, play, fun and accessibility. It rolls in thermals as a real paraglider does. To learn more and purchase follow the link to RCParaglider. E-Walk, Skywalks electric paraglider propulsion system is nearing completion and should be available to buy in 2011. Why electric paraglider propulsion system, the aim of the project is to reach thermals and achieve long cross country flights. 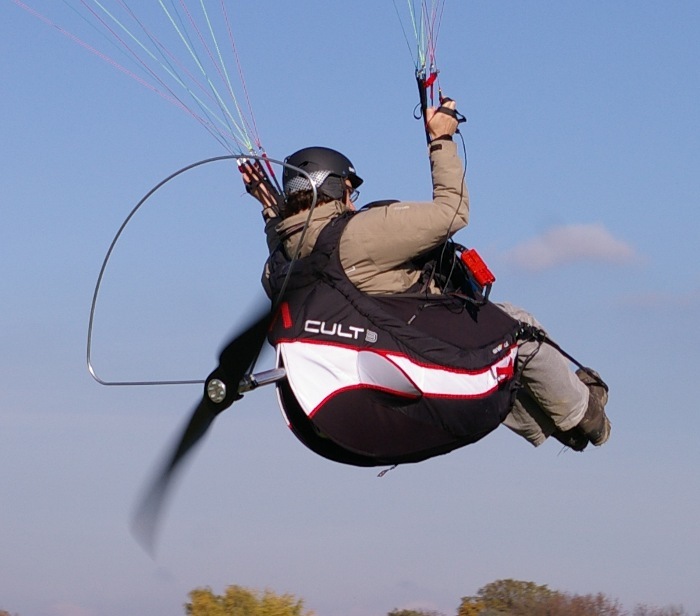 As such, it has been designed for in-flight comfort and is built into Skywalks paraglider harness, with reserve and back protection in place. Thrust Vector, an adjustment is made to change the angle of the prop by 45 degrees between take-off to flying. The adjustment is made by stepping on the stirrup, it assures optimum efficiency both in flight and on the ground. Brushless motor is powered by Lithium Ion batteries and the unit has already passed the new EMV (electro-magnetic tolerance) testing criteria, a pre-condition for certification.